There are in fact two species of Platanna one which is found all over South Africa and another the Cape Platanna which is found in the Cape only. The two frogs are distinctly different from each other. 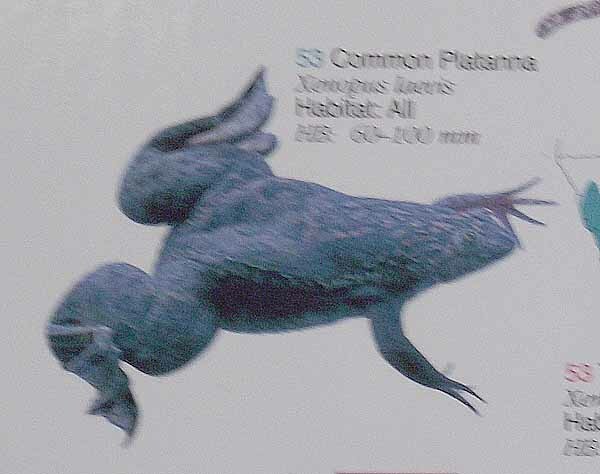 The common Platannas are podgy frogs with small heads and disproportionately large hind legs while the Cape Platanna has a smaller head and a larger body measuring some 5cm from snout to vent. It has dark stripes on its back and mottled patterns on its stomach. The common Platanna frog is well known throughout the world as it is the frog that is used for pregnancy testing. It was discovered in the 19th century by European scientists although it was already well known by the locals who used them as a source of protein and an aphrodisiac or fertility medicine. The platannas are totally aquatic and will only leave their ponds to move to another during wet conditions. The platanna is well suited to its life in the water and is, able to swim in all directions, including backwards. They are air-breathing and depend on well developed lungs to breathe. Their bodies are streamlined and slippery and they have powerful hind legs and fully webbed toes. Lateral sense organs are well developed which enable them to detect vibrations in the water. These frogs are voracious predators and also scavenge for food. Their cousins the Cape Platanna are only found in the Cape and were discovered in 1927. The Cape Platanna is very picky with its habitat and because of that it is declining rapidly. It likes the seasonal and high acidic levels of the black water lakelets of the Cape Floral Kingdom, whereas the common Platanna prefers permanent standing water bodies with lower acidic levels. Its decline was speeded up in the Cape Nature Reserve when larger animals were introduced to the park. This necessitated some of its water holes to be enlarged and allowed the common platanna access to it. The result was that the two frogs started to interbreed and all males produced from these matings were sterile. Another problem is that the common Platanna takes over the habitat of the Cape Platanna and feeds on its tadpoles. To avoid the extinction of the Cape Platanna 300 of them have been caught and placed in other Reserves to protect them.